Winner of the 1944 Governor General’s Literary Award For Fiction. Earth and High Heaven is, simply, a drama of human relationships — of two people in love who are confronted by the obstacle of racial intolerance — presented with such cutting truth, such fidelity to life, such compassion and understanding, that their problem becomes, indelibly, the reader’s own. With rare perceptiveness, Gwethalyn Graham takes the reader into the lives of Erica Drake and Marc Reiser, whose two worlds are separated by families and conventions. Here is the story of a man and woman who dared earth and high heaven to make their vision real. Gwethalyn Graham was born January 18, 1913 in Toronto. Her father was a lawyer, her mother entertained numerous international figures of importance in their home, and both encouraged their four children to think for themselves — theirs was a family which set the rules rather than followed them. At the age of 25, in 1938, she won her first Governor General’s Literary Award for Fiction for her novel Swiss Sonata. After Earth and High Heaven, Gwethalyn wrote for Saturday Night, Chatelaine, and for film and television, and completed a collection of letters with Solange Chaput Roland titled Dear Enemies (1963). 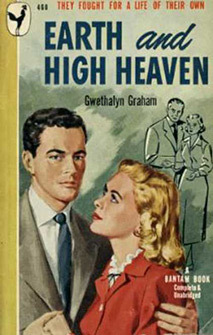 Recipient of a Governor-General’s Literary Award for both her 1938 novel, Swiss Sonata, and her 1944 novel, Earth and High Heaven, Graham was part of Montreal’s intellectual community in the 1930s and 40s. She was a socio-political writer at a time when few Canadian novelists were creating works in this vein, and was a remarkably accomplished and inspired woman who defied convention and challenged contemporary prejudicial thinking.